Verbal Croquis recently posted a project she did for Barbie (Pop Diva Barbie… even includes paparazzo… hilarious) which brings to mind my own entry for a contest sponsored by Barbie back in second year. A bit of background. The Barbie people came into class and asked a couple of trivia questions. Of course fashion nerd that I am I got one right and won a Bob Mackie Barbie on the spot. Neat! They presented the project – design a Barbie, anything goes, extra points if we tie in a Canadian angle. From sketches submitted finalists would be chosen to actually execute their concept on a doll. My friend Christy Marcus won the contest and deservedly so. Her design was feminine, uniquely Canadian, and perfectly in tune with the collectors market. Click on the portfolio tab on her website to see her entry. I was just crazy enough to imagine my entry even had a chance. I even experimented with shaving Barbies, carving into their bodies, and colouring them silver (like the disembodied arm on the entry). 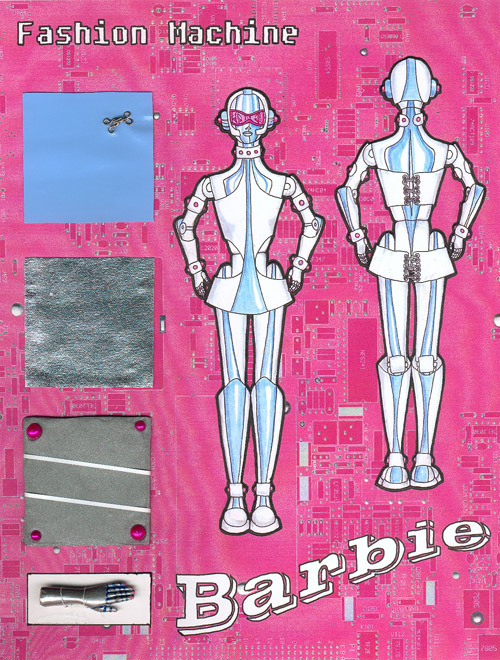 But I guess the world was not ready for a bald, silver, robot Barbie. It’s interesting to me that I was also the only entrant who copied Barbie’s proportions exactly for the illustration. Not exactly what the Barbie people were looking for, I guess, but to this day I still love my little Fashion Machine. ooh fun! also reminds me of that shot of nadja auermann done up half cyborg. i think helmut newton shot that. btw, you have to stop complimenting me–my head’s going to get so big i’ll need to move to a bigger house! I edited the post just for you. But seriously, if you want to stop getting compliments, stop posting amazing work. I mean, come on, why not post some crap?